Get ready for the best events! Event Drop Off has tailor-made Tag Archery games for those over 16 years of age. 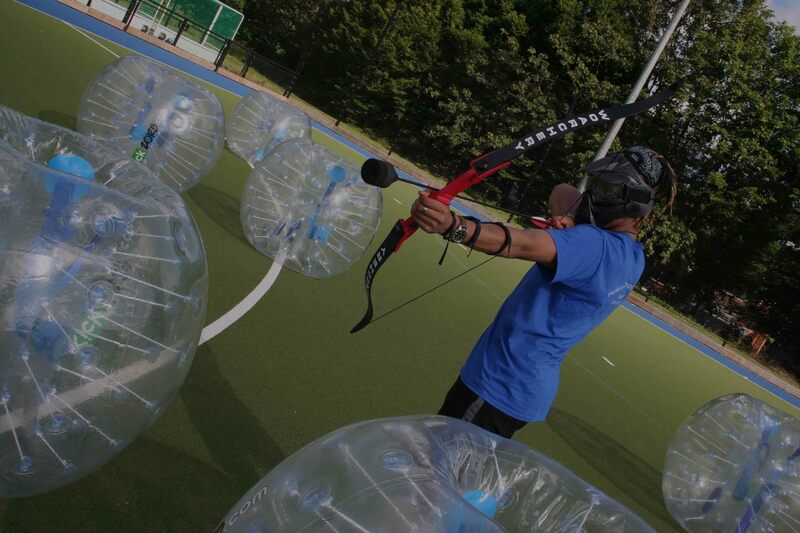 Tag archery is an awesome and exhilarating mix of paintballing, archery and dodgeball. We have a wide range of different events for those looking for a party to remember. Stand out from the crowd and pick from one of our amazing event packages. Holiday Drop Off is a fantastic multi-sports camp for children aged 5-14 running throughout school holidays. Why not try our drop in sessions! KickZorb.com is now offering party packages for children older than 9. There is no better way to celebrate than sharing an energetic Zorb party with a group of friends. Show your skills by aiming, dodging and shooting. Claim your shot at being the best. Through a selection of games, will you and your team mates be victorious and join the winners table? Tailor made events suited for you! Across all events, we have a range of different prices and options to suit you. If you would like to discuss different options, give us a call. Most of our services operate at Dulwich College Sports Club although we are not limited to this venue. If you know of a suitable location, we can arrange coming to you. All of our CRB’ed staff are trained in providing the most thrilling event possible. With years of experience, we know exactly what works best. If you would like to discuss how we can spice up your event, then we would love to hear from you. We will make your event one to remember and one that will stand out for years to come.